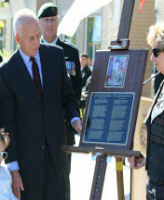 Son of Reine Judith Dawe of Perth, Ontario. Husband of Tara Christina Dawe of Kingston, Ontario. Commemorated on Page 226 of the In the Service of Canada Book of Remembrance. Request a copy of this page. Access by car Highway 401 and exit at Sydenham Road South. Turn left onto Princess Street (Highway 2), then turn left at the next stop light. The cemetery is on the first left on Counter Street across from the J. Reid Funeral Home. 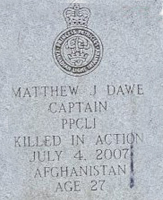 Grave Marker – Captain Matthew Dawe was born into a military family – his dad served 33 years in the army. He had three older brothers – all of whom joined the Canadian Forces prior to Matthew. His Royal Military College of Canada number is 22596. 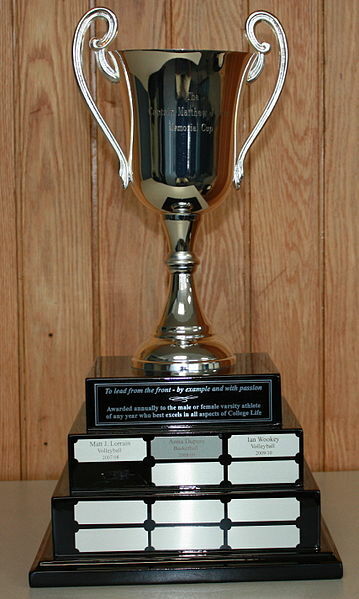 He was both Cadet Wing Senior and captain of the varsity volleyball team in his final year at RMC. 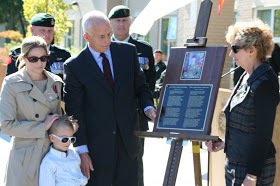 Prior to enrolling at RMC – he was a private in the Princess of Wales Own Regiment. On graduation weekend – he was married. Following RMC, he became a trained Infantry Officer. He was posted to the Princess Patricia’s Canadian Light Infantry, based in Edmonton. While in Edmonton his son was born. He trained both within Canada and outside the country to qualify as a Platoon Commander. He died while serving in Afghanistan during Operation Luger, an engagement he planned and named after his son Lucas. 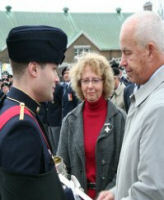 Profile and photo originally appeared in Remembrance Day edition 2012 of e-veritas, alumni journal of the Royal Military College of Canada. 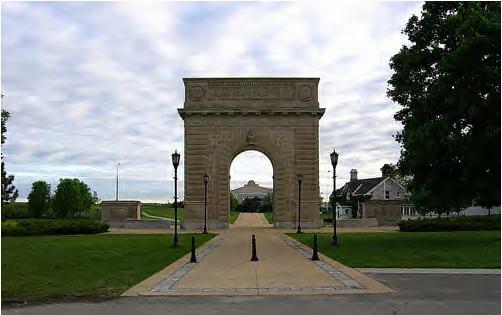 Memorial – Ex-cadets are named on the Memorial Arch at the Royal Military College of Canada in Kingston, Ontario and remembered in memorial stained glass windows to fallen comrades. Matt Dawe was born into a military family – his dad served 33 years in the army; He had three older brothers – all of whom joined the Canadian Forces prior to Matt. 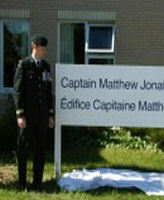 His Royal Military College of Canada number is 22596. He was both Cadet Wing Senior and captain of the varsity volleyball team in his final year. 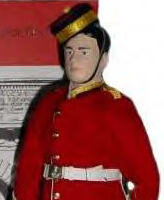 Prior to enrolling at RMC – he was a private in the Princess of Wales Own Regiment. On graduation weekend – he was married to Tara Christina. Following RMC – he became a trained Infantry Officer. He was posted to the Princess Patricia’s Canadian Light Infantry, based in Edmonton. While in Edmonton their son Lucas was born. He trained both within Canada and outside the country to qualify as a Platoon Commander. He died while serving in Afghanistan during Operation Luger, an engagement he planned and named after his son Lucas. 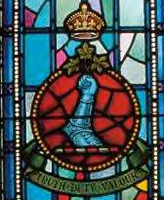 Memorial Stained Glass – Ex-cadets are named on the Memorial Arch at the Royal Military College of Canada in Kingston, Ontario and remembered in memorial stained glass windows to fallen comrades. 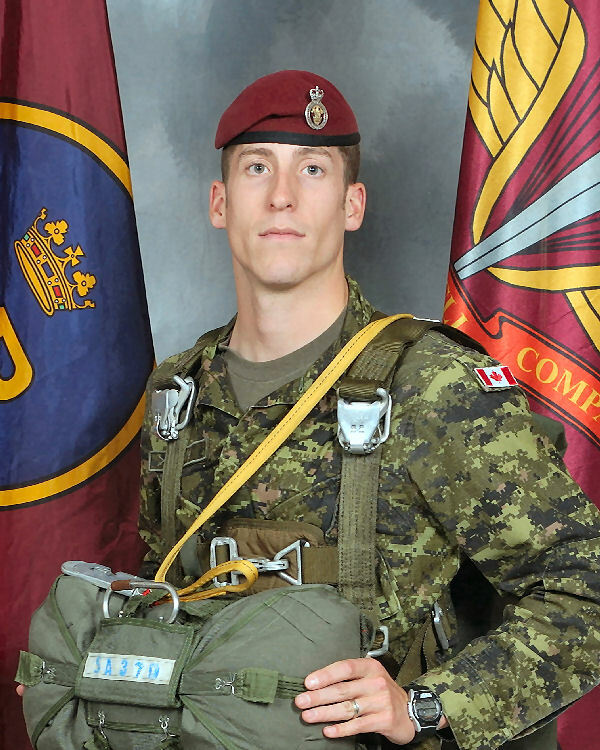 Matt Dawe was born into a military family – his dad served 33 years in the army; He had three older brothers – all of whom joined the Canadian Forces prior to Matt. His Royal Military College of Canada number is 22596. 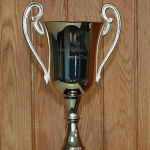 He was both Cadet Wing Senior and captain of the varsity volleyball team in his final year. Prior to enrolling at RMC – he was a private in the Princess of Wales Own Regiment. On graduation weekend – he was married to Tara Christina. Following RMC – he became a trained Infantry Officer. He was posted to the Princess Patricia’s Canadian Light Infantry, based in Edmonton. While in Edmonton their son Lucas was born. He trained both within Canada and outside the country to qualify as a Platoon Commander. 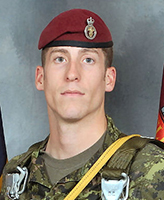 He died while serving in Afghanistan during Operation Luger, an engagement he planned and named after his son Lucas. 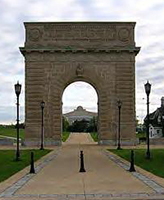 Memorial Doll – Ex-cadets are named on the Memorial Arch at the Royal Military College of Canada in Kingston, Ontario and remembered in memorial stained glass windows to fallen comrades. 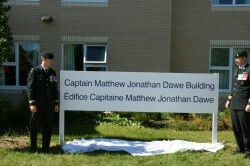 Matt Dawe was born into a military family – his dad served 33 years in the army; He had three older brothers – all of whom joined the Canadian Forces prior to Matt. 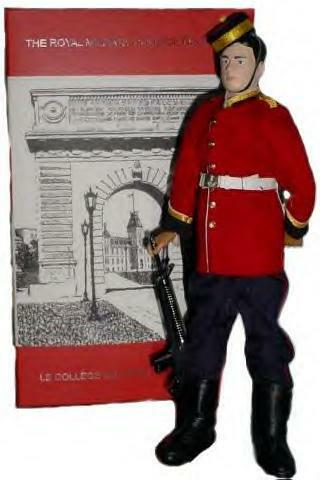 His Royal Military College of Canada number is 22596. He was both Cadet Wing Senior and captain of the varsity volleyball team in his final year. 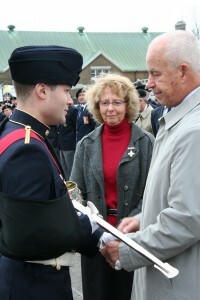 Prior to enrolling at RMC – he was a private in the Princess of Wales Own Regiment. On graduation weekend – he was married to Tara Christina. Following RMC – he became a trained Infantry Officer. He was posted to the Princess Patricia’s Canadian Light Infantry, based in Edmonton. While in Edmonton their son Lucas was born. He trained both within Canada and outside the country to qualify as a Platoon Commander. 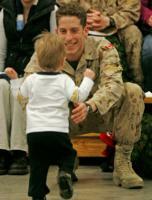 He died while serving in Afghanistan during Operation Luger, an engagement he planned and named after his son Lucas.